Last edited by Aditya : 10th February 2016 at 16:15. 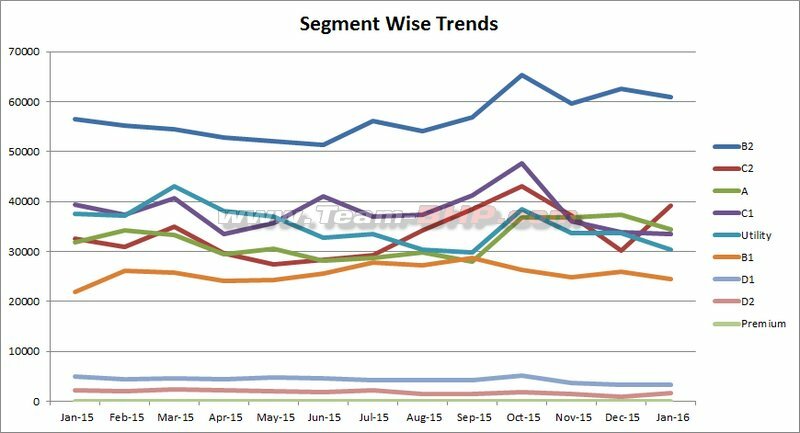 I would like to add to the statistics with figures for segment-wise market share over a period of last month, 3 months and 6 months. 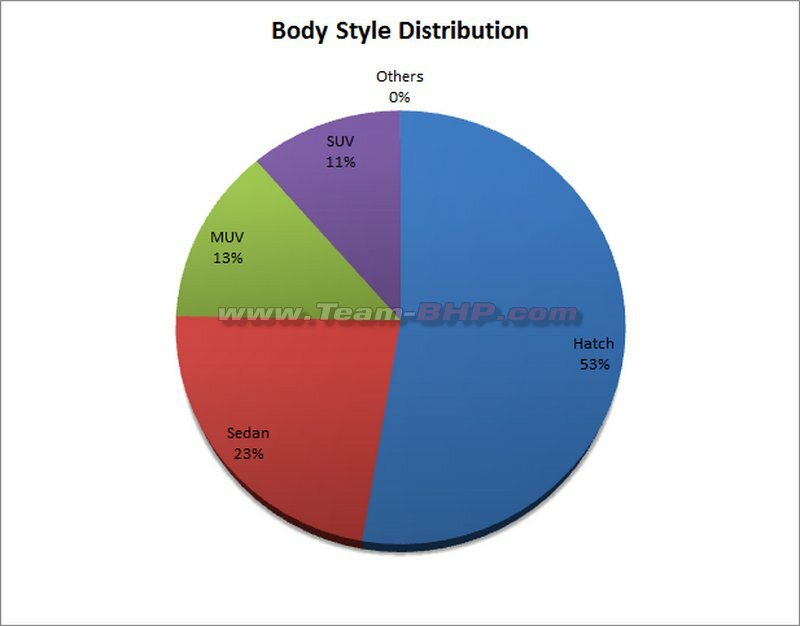 These numbers give a fair picture of each vehicles market share within its own segment and whether they are gaining or losing. 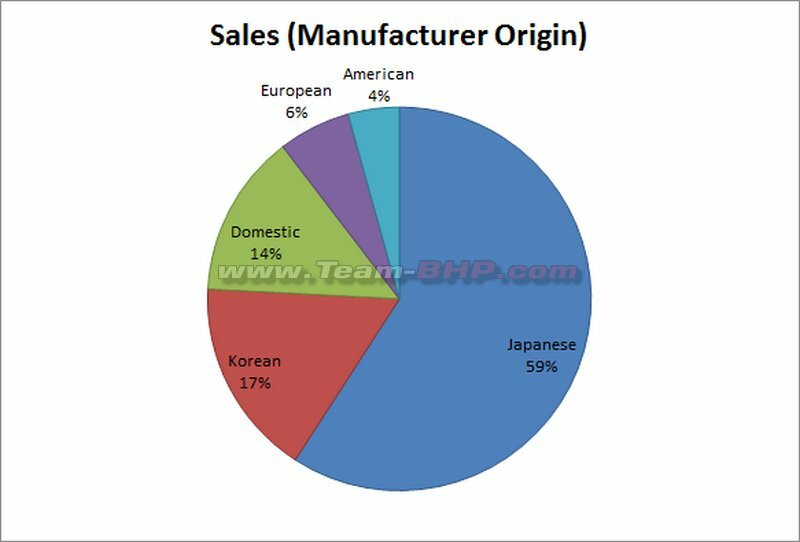 Plus the percentage market share and overall segment-wise sales are colour-coded to reflect relative position. Segmentation might not be perfect but I have done it to the best of my knowledge. Have also highlighted (in yellow) top 10 sellers for each month over the past six months. Hope this is helpful. There is an error in the top 20. The Kwid with 5985 dispatches should figure in the list. Finally the most awaited thread of the month is here, but it seems to be overshadowed by the Auto Expo this time around. Thanks to Aditya for compiling this superb report. * Ciaz's sale increased from ~2.800 units to ~5,400 units, i.e., it's usual level. Does anyone has any idea why were the number was so low in December 2015? 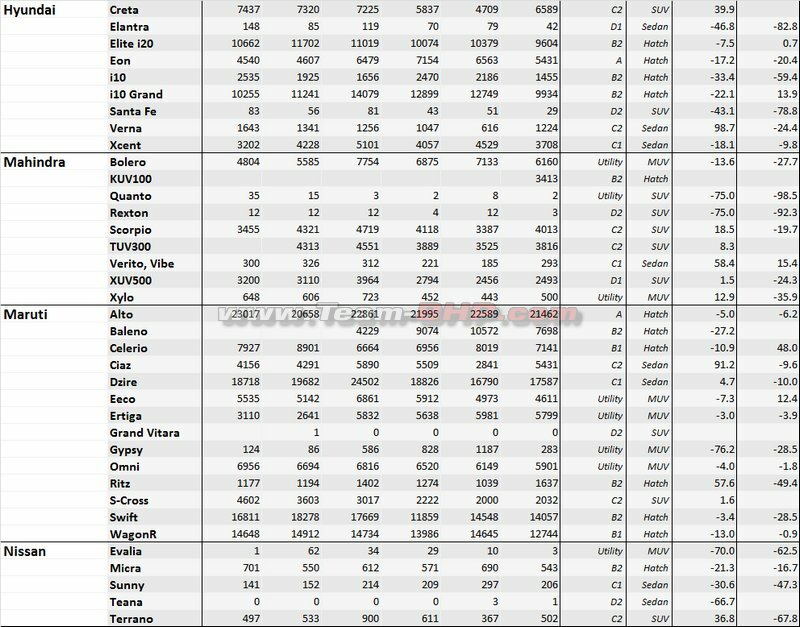 Interesting to see Jazz numbers jump by 2107 units in January over December while Baleno numbers over the same period declined by 2874 units. 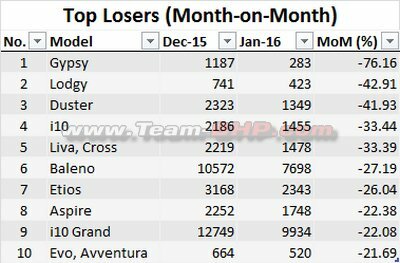 Polo too gained 841 units over December despite the VW scandal news. May have to do with long waiting periods of the Baleno making customers look at the Jazz which is available readily or Polo, or reduced production in December due to maintenance or might be purely random as well. Will need to look at the next 3-4 month reports to ascertain any reason. Elite i20 numbers have dipped too but not by a significant extent. 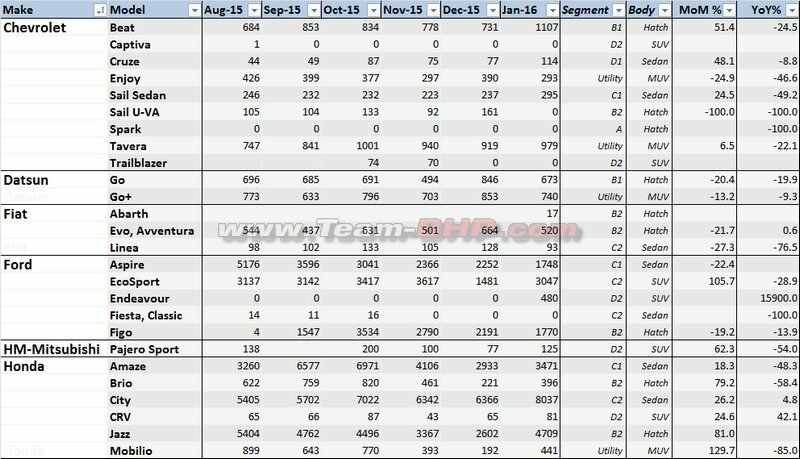 Ecosport regains the volume, this one is very consistent for Ford and hope Ford Figo picks up. Abrath made 17 numbers for Fiat. Here is some insight to the toppers in the Luxury segment - Jan sales. 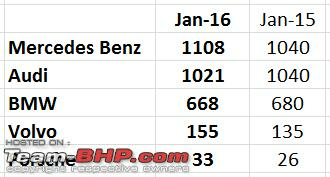 Mercedes Benz leads the segment, Audi close behind with BMW lagging way behind. Entire break up of this segment. Quanto, Rexton, Fluence, Aria, Yeti, Superb (awaiting the next Gen) sell in single digits and competing with cars in the Luxury segment- interesting! Last edited by volkman10 : 10th February 2016 at 16:16. Thanks, Have been eagerly waiting for the sales figure for January. 480 deliveries for new Ford Endeavour in the first month itself. It has already effected the numbers for Toyota Fortuner. Hopefully sliding number will force the Toyota to launch the new Fortuner this year itself. Excellent show by Maruti, yet again. Elite i20 just inches ahead of the main competitor, Baleno. And the Jazz also sees a spike in sales. 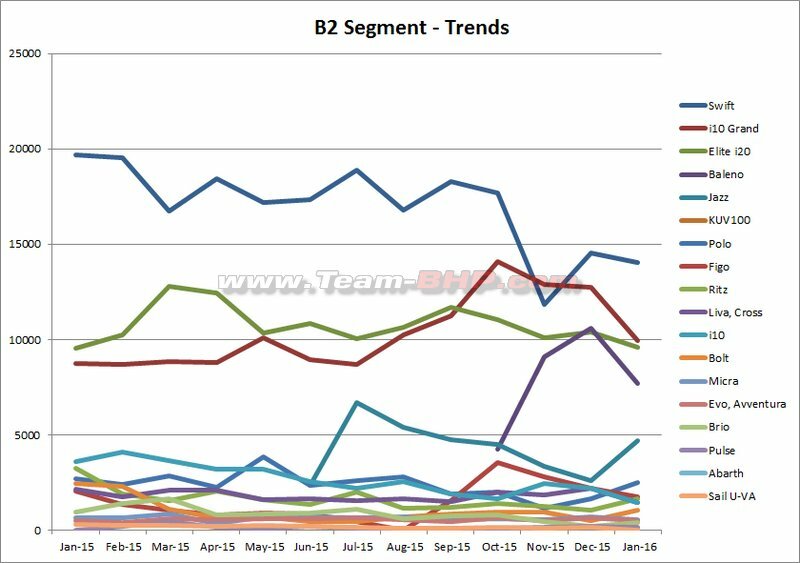 The B2 segment is definitely heating up. Disappointed by the Abarth Punto. Hoped the Indians would welcome a Hot Hatch with more open arms. 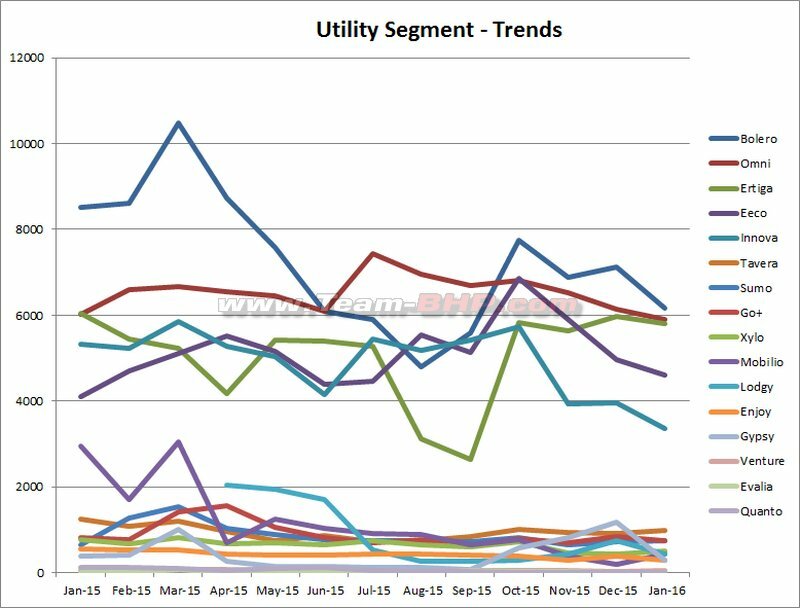 And gosh, just look at the graphs of C2 Segment and Utility Segment. So many ups and downs and crisscrosses; looks like a bag of worms has been set loose. Last edited by drive2eternity : 10th February 2016 at 16:08. 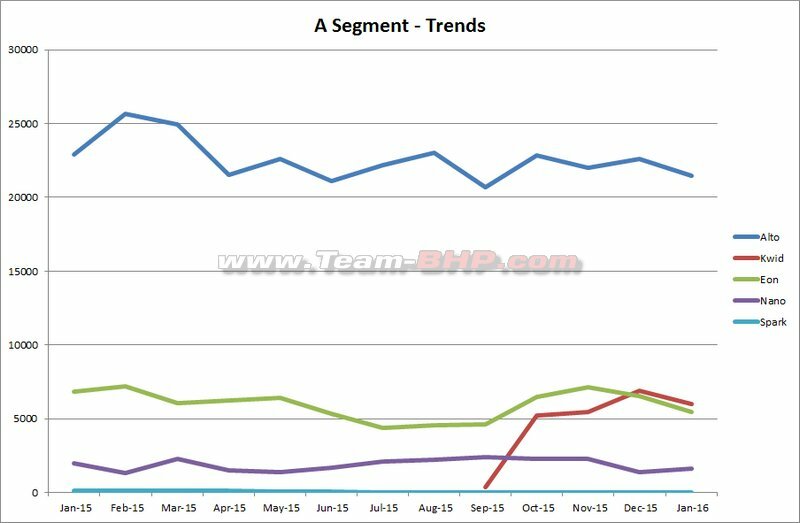 Kwid dispatches seems to have gone down. Not a good sign considering the 90,000 bookings. Renault need to increase that to 5 figure numbers as soon as possible. With the 1.0 and AMT coming, they need to be on top of their game to make sure they can dent the Alto. Interestingly all cars in this entry segment seem to be losing numbers. Elite i20 retains the lead in the premium hatch segment. Baleno drops from the previous months high. Long waiting periods turning people away? Or buyers waiting for the Brezza? Jazz maintaining a healthy 3rd place. Polo continues to attract its loyal followers. Big news in the segment is the disastrous performance by Figo. ~1700 units is a very poor number for a new car. 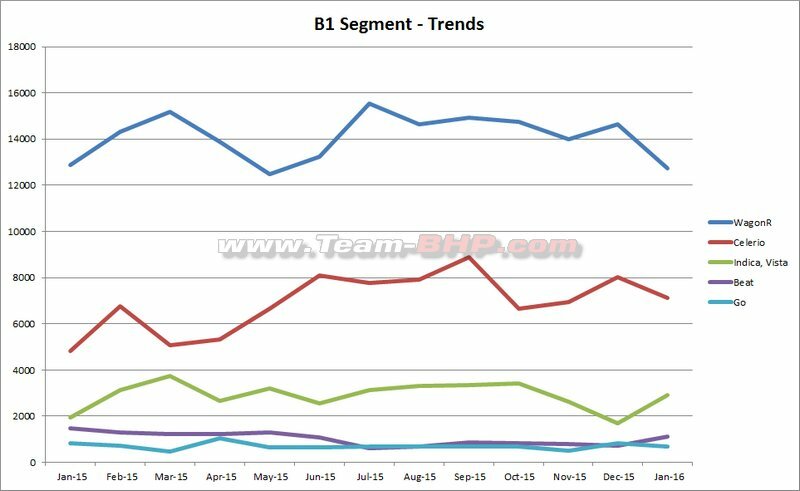 Largely looks to be tied to Ford's poor marketing and the dealers inability to make and meet commitments. Punto continues to struggle. The compact sedan space seems to have taken a hit. Even the Dzire has dropped to ~17K units. Amaze and Xcent in distant 2nd and 3rd place with ~3000 units. Aspire struggling at ~1700 units like its hatch twin. 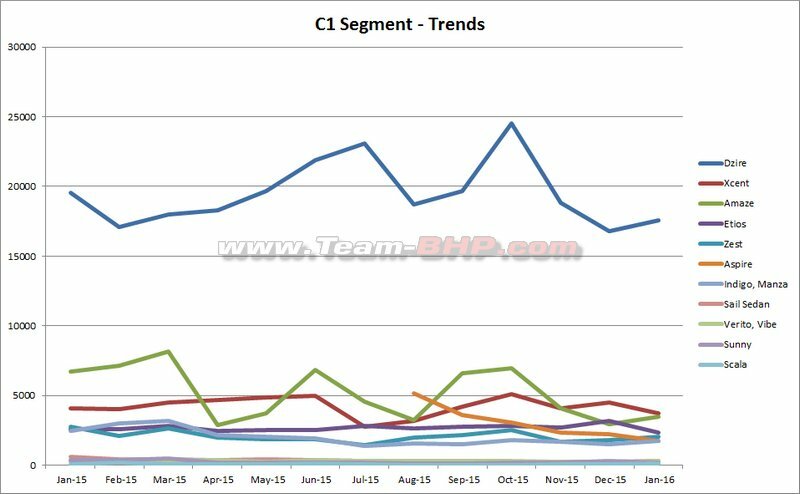 Overall looks like buyers are looking more towards the compact SUV's and premium hatches? 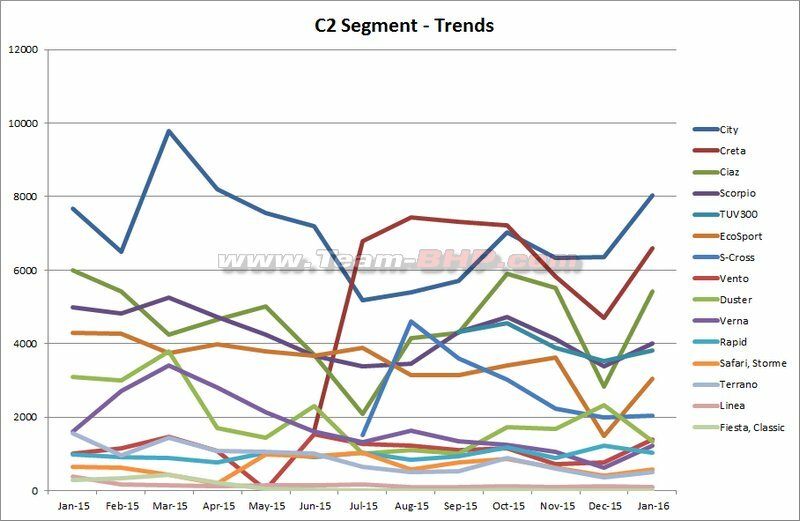 The C2 sedan space continues as usual. City continues to dominate with ~8000 units. Ciaz not able to bridge the gap and seems to be settling at 5-6000 units. Vento takes the distant 3rd place from Verna with ~1300 units. Verna and Rapid round up the top 5. With the refresh, Vento can expect to pick up some more numbers. The Creta continues to rule the Compact SUV space with the Ecoport doing its usual numbers. Creta seems to have dropped some numbers from its previous highs Both will come under pressure from the Brezza. Duster continues to struggle and Terrano in triple digits. Mahindra's SUV's all remain consistent. Xylo and Quanto are their only flops. The Endevour makes a strong start and Fortuner numbers go down by half. Clear sign that it is impacted by the Endevour. Ford is doing its best to mess this up by delaying deliveries and not committing clear wait times. Need to see if they recover or go ahead and mess up. Another 0 month for the Trailblazer. Even the few years old Yeti sells 1 unit and the Rexton sells 3. 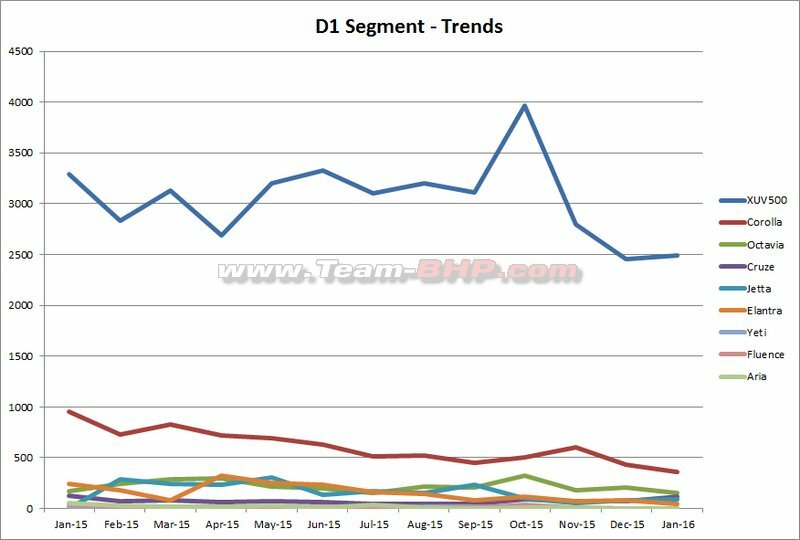 D segment continues to be ruled by the Corolla, but a huge drop in numbers. Octavia in 2nd place and the rest of the gang close by. Interestingly, the Camry sells more than most of the D segmenters. 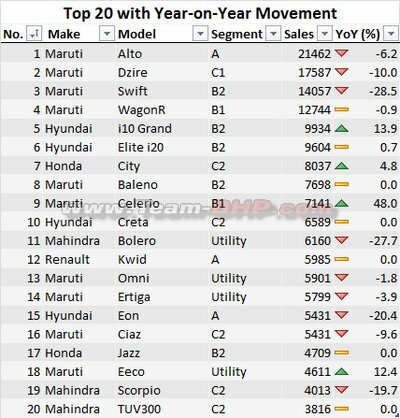 As per experience of a friend trying to buy the Elantra, Hyundai seems to have stopped/reduced production. There was talk of the new Elantra at the Auto Expo. Have not seen it yet. Good to see the detailed luxury car numbers data. 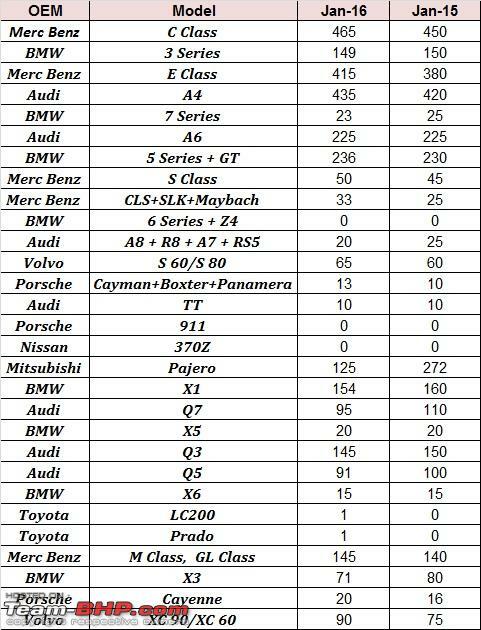 Some of these biggies sell more than the poor selling mass market cars.Interesting point, Mercedes, BMW and Audi all individually sell more than Fiat and are pretty close to Skoda. Something Fiat and Skoda Management should take note off. Good to see the Abarth numbers. 17 is a very low number. Expected more considering the value proposition of the Abarth. VW says 20% of the Polo sales are GT variants. That would put the GT number at ~500. Maruti: Going from strength to strength. Pretty much every model in the Top 20. With the Brezza and Ignis coming, will decimate competition. Welcome entry expected into the performance segment with the Boosterjet. Hyundai: Continues to do well, but the Creta will be under pressure from the Brezza once launched and the i20 is under pressure from the Baleno. With no big launches for the year, needs to watch out. Mahindra: we can hate their new designs, but they seemed to have got the products right. Both the TUV and KUV have started pretty well and the other models continue to sell in good numbers. Widened the lead over 4th place Honda. Honda: City continues to rule. Jazz is selling well, but no where close to segment leaders. Amaze is up and down and will continue to be under pressure. Brio and Mobilio continue to be flops. Lot depends on the BR V.
Tata: Should have had the Zica out in January itself. Now with the re branding it is going to be delayed. 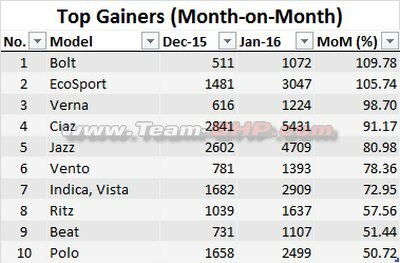 Most other new models struggling to pull in decent numbers. Toyota: Nothing much to say. They seem to be happy milking the taxi market. Their bread and butter fortuner is getting hit by the Endevour. Renault: Kwid has exploded the numbers for Renault, but dispatches have gone down. ideally they should be going up. Otherwise will end up being a lost opportunity for Renault-Especially with the 1.0 and AMT coming up. Ford: Ford and its dealers seem to be trying their best to make flops of out its line of competent products. Both Figo and Aspire are at sub 2000 numbers and don't deserve that. From the Endevour thread, the general feedback is dealers don't seem to have a clue on dispatches and delivery estimates. With the Brezza looming over the Ecosport, VW Ameo coming soon, Ford needs to get its marketing and delivery sorted out. Volkswagen: No big numbers. But going steady in spite of all the scandals. With the Polo and Vento refreshed and the Ameo coming. Can look forward to some increase in numbers. Need to focus on the After Sales. Did not hear much about that from the folks at the Auto Expo. GM: Seems to have a lot of '0' in the sales chart. No dispatches of UV-A, Captiva and Trailblazer. Some production constraint or a inventory pile up at dealers? Nothing really to look forward to from the worlds 3rd largest manufacturer. Nissan: Numbers continuing to drop with no signs of recovery. The Datsun brand also seems doomed for failure. Skoda: 2 brilliant cars in the Octavia and Rapid. But with this small portfolio and iffy after sales, destined to continue in the bottom. No real plans also. Fiat: Nothing much to say. 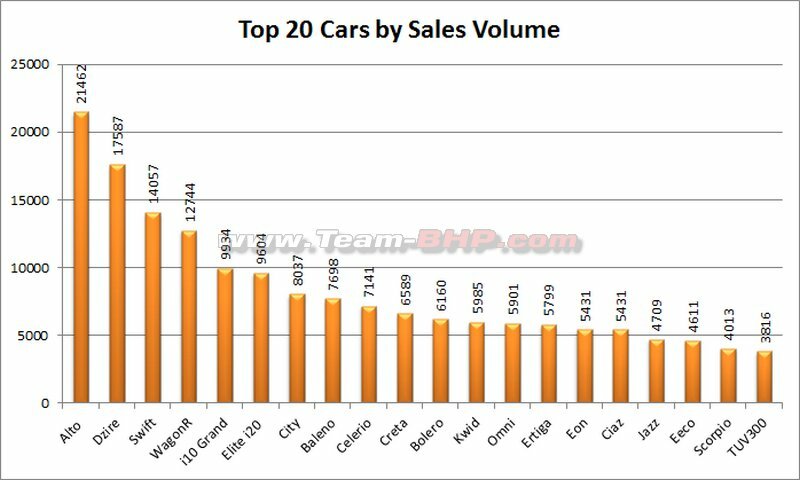 Must be embarrassing to sit far below even Mercedes, Audi and BMW in the monthly sales. weird launches like the Punto Pure and the 125s Linea are not going to help. Last edited by Rajeevraj : 10th February 2016 at 16:35. 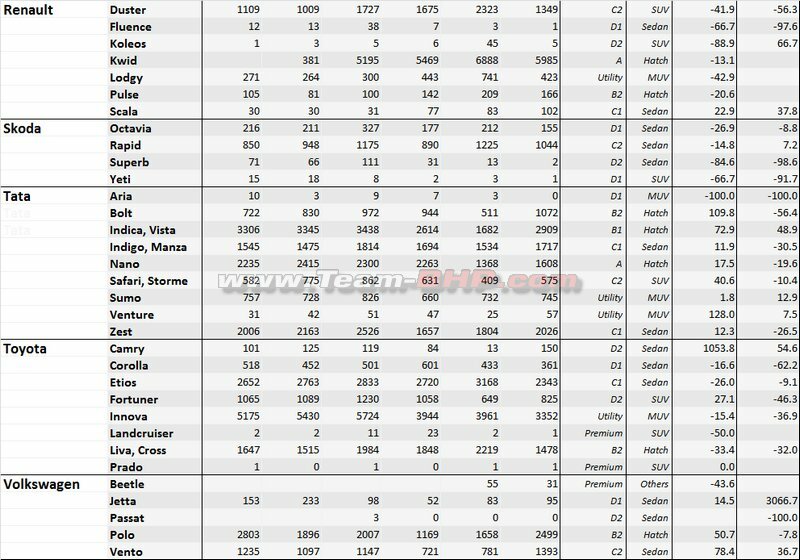 Tata Motors sees an uptick in all its cars (except Aria which was anyway in single digits) and regains its 5th place which it lost to Toyota last month. Toyota has lost numbers across its range, going back to the 6th place. Around one lakh bookings have already been received for Kwid in the Brazilian domestic market itself. I still don't see how they can meet the numbers unless they start making 20000 a month. Ford has overall improved its numbers because of the Ecosport and Endeavor yet lost numbers in the Figo twins. Early days for Endeavor and what numbers it settles at remains to be seen. 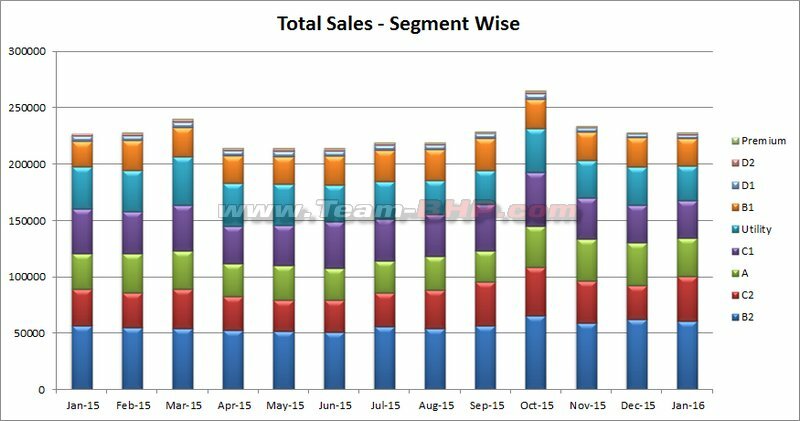 Honda and Volkswagen have increased their numbers significantly compared to Dec'15. Is the drastic reduction in Verna a planned one in order to make way for other Hyundai products like Creta? I did not realize that Verna count has come down that low. Or is it just that City/Ciaz have taken away the numbers. The order of 1000-1500 seems to be consistent for Verna for the last 6 months of so.